It was the fervent belief of many in the early years of cinema that justification for the medium lay in how it interpeted stage drama. At a time when censorious authorities looked down upon the dubious cinema (with its low class audiences) and cinema was reaching out for respectability (and properties that were out of copyright), Pathé with its Film d’Art and Film d’Arte Italiana companies, and Adolph Zukor’s policy of ‘Famous Players in Famous Plays’ showed that there was financial good sense in bringing high-class drama to the cinema screen, however mutely. The pinnacle of stage drama was, of course, William Shakespeare, and film companies in the silent film era took on the Bard with enthusiasm. The numbers are extraordinary. Some two hundred films, most of them one-reelers of the pre-war period, were produced that closely or loosely owed something to one or other of Shakespeare’s plays. Some film companies showed a particular interest: Vitagraph filmed Antony and Cleopatra, Julius Caesar, Macbeth, Othello, Richard III, Romeo and Juliet (all 1908), King Lear, A Midsummer Night’s Dream (1909), Twelfth Night (1910) and As You Like It (1912). Thanhouser made A Winter’s Tale (1910), The Tempest (1911), The Merchant of Venice (1912), Cymbeline (1913) and King Lear (1916). Cines, Kalem, Biograph, Ambrosio, Gaumont, Eclair, Nordisk, Milano and several others filmed the plays. This was more than enthusiasm for high culture; it was good business. 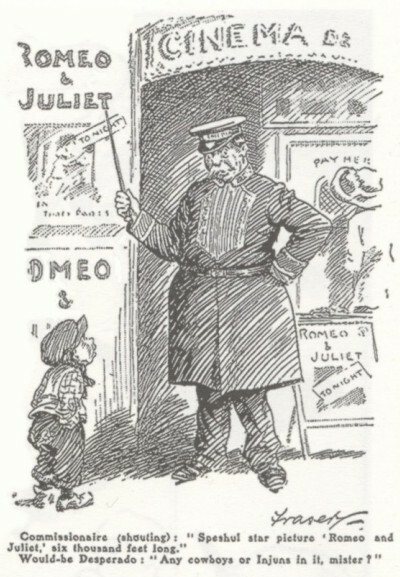 Shakespeare films appealed to an audience which found costume dramas in general to be a treat, and which was accustomed to boiled-down Bard from school texts and stage productions which concentrated on the highlights from the plays (such as the Crummles’ hectic production of Romeo and Juliet portrayed in Charles Dickens’ Nicholas Nickelby). Of course, not everyone wanted to see high culture quite as much as the cinema sometimes wanted to be associated with such culture (see the cartoon at the end of this post), but more than enough were impressed, and entranced. Once films became longer – ironically as the cinema became closer in form to the theatre – the number of Shakespeare films fell, because longer productions were more of a challenge to audiences. 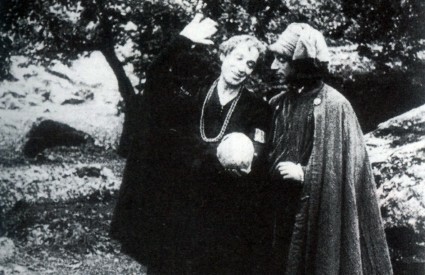 But even then there was a burst of activity in 1916 (the tercentenary of Shakespeare’s death), with half-a-dozen or more productions in that year alone, and versions of the plays continued in silent form throughout the 1920s, with four key titles coming from Germany – Hamlet (1920, with Asta Nielsen as the Dane), Othello (1922, with Emil Jannings and Werner Krauss), Der Kaufman von Venedig (The Merchant of Venice) (1923, with Henny Porten) and Ein Sommernachtstraum (A Midsummer Night’s Dream) (1925, Werner Krauss again). First came scores of silent Shakespeare films,one- and two-reelers struggling to render great poetic drama in dumb-show. Mercifully, most of them are lost. Silent Shakespeare film could not be art, a new art. The aesthetic problem is how to make good film which is good Shakespeare. It could not be good Shakespeare because too much was missing. It is has been the task of a few of us (and I’ve been involved) to prove those words wrong. Silent Shakespeare was good Shakespeare, not because of what was missing, but because of what was there to be seen – a new medium expressing itself imaginatively while asserting its social worthiness and cultural relevance. To study silent Shakespeare films is to see films discovering what they could do. Yes there are histrionics at times, and yes there is some aburdity involved when complex plots are crammed into a ten-minute reel, but equally there is artistry, feeling and subtlety of interpretation. Have you ever seen a ballet of Romeo and Juliet and complained that the words were missing? Of course not. Shakespeare without the words is not a lesser form, but simply a form that requires its own special understanding. It expresses the significance of its subject within its specific constraints – which is precisely what art is. 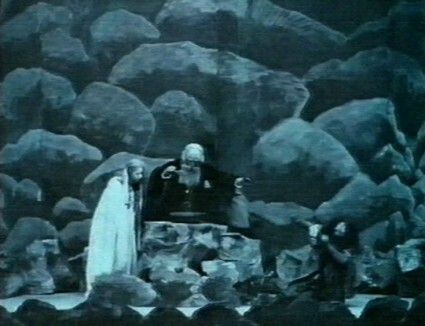 The tide started to turn with the release of the British Film Institute’s video compilation Silent Shakespeare (1999), a work that was a revelation to many. Even hardened theatricals could see the special virtues in the Clarendon Film Company’s delightful reworking of The Tempest (1908) or the elemental passion evident in Ermete Novelli’s stunning performance in Re Lear (1910). The DVD has found its way onto many a university library shelf, while a number of scholars have begun to take on the silent Shakespeare film with fresh eyes – among them Jon Burrows, Roberta Pearson, Anthony Guneratne and Kenneth Rothwell. 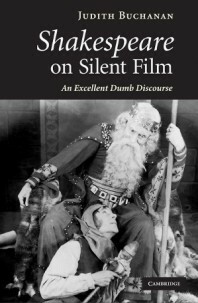 The leading champion, however, has been Judith Buchanan, whose quite marvellous Shakespeare on Silent Film: An Excellent Dumb Discourse is published this month by Cambridge University Press. This is the sympathetic, understanding account of a phenomenon that we have been waiting for. It is not a comprehensive history of the silent Shakespeare film – Buchanan defers to Ball in that respect – instead it concentrates on exemplary films and on uncovering the social, cultural and economic contexts. So it is that an opening chapter details a nineteenth-century legacy of performance, with particular attention to Shakespeare and the magic lantern, showing that the silent Shakespeare film was part of an established tradition. Chapters then follow on the first Shakespeare film, King John (1899), featuring Herbert Beerbohm Tree (also on the BFI DVD); Shakespeare films of the ‘transitional era’ between the early and late 1900s, with close, engrossing readings of Clarendon’s The Tempest and Film d’Arte Italiana’s Othello (1909); the ‘corporate authorship’ of Vitagraph’s productions; the contrasting interpretations of Hamlet by Hepworth (a renowned British 1913 production with theatrical great Sir Johnston Forbes Robertson) and Amleto, a 1917 Italian film starring Ruggero Ruggeri, little-known but perhaps the most accomplished extant realisation on Shakespeare on silent film (it’s crying out for the two Hamlets to be released jointly on DVD); the several films of the tercentary year, including the rival Romeo and Juliets starring Francis X. Bushman/Beverley Bayne and Theda Bara/Harry Hilliard, both films alas lost; the German productions of the 1920s; and wordless Shakespeare today (there are some stage productions experimenting with silence, notably Paata Tsikurishvili’s Synetic Theatre). It’s written for a literary studies audience, but it is grounded in exemplary original research (Buchanan has toured the world to track down the relevant prints) and it is a pleasure to read. There is much here to detain anyone keen to extend their knowledge of film history. She knows her films as well as her plays – a rare and most welcome combination. Above all, Buchanan opens up the subject in all its richness of theme, inviting others to explore further, illuminating the films that we are so fortunate have survived. We will still turn to Robert Hamilton Ball for his extensive documentary evidence, but to Buchanan for her sophisticated understanding. The International Database of Shakespeare on Film, Radio and Television, an online filmographic database not yet officially released but available in a test version, hopes to be comprehensive for the silent Shakespeare film. Buchanan herself provides a filmography (restricted to films mentioned in her text), including the location of archive prints. Around forty silent Shakespeare films survive today, mercifully. Luke: Great topic. I remember years ago the Folger Shakespeare Library came to San Francisco and they had some kiosks showing clips from silent Shakespeare movies. These were the first I got to see. Judith Buchanan’s book should be a good one, and I like her subtitle. I’ve always had a soft spot for silent Shakespeare films. Partly it’s my literary background, partly the oddity of the idea appeals, but mostly because Shakespeare – on occasion – inspires filmmakers to remarkable things, and the best of silent Shakespeare films are indeed remarkable, creative works. I would place the 1908 Tempest, the 1910 Re Lear and the 1917 Amleto high on my list of the best of silent films overall. It’s a great shame that the latter isn’t available on DVD – its obscurity, and the nitrate damage to some sections of the only surviving original copy make it unlikely that it will appear, though I have badgered the BFI about it (as has Judith, who provides the commentary for the DVD version of Silent Shakespeare, I should have said). And it’s a great subtitle. You can always count on Shakespeare to come up with the right phrase, for practically anything.